Hay. It is really just dried grass and stuff. Mowed when the grass is high, allowed to dry in the sun, turned a bit, then squished into blocks. Stacked in a barn where it stays dry until an animal needs to eat it. Calvin has 175 acres around the corner from us. Born in 1925, he is still running his farm the way he was taught as a kid. Modern farming techniques involve rolling hay into massive bales that require an entire new set of equipment to get the exact same job done...but then the farmer is in debt for shiny new equipment. The big bales, round or square, can't be moved by humans so when the hay is needed a diesel burning piece of equipment must be fired up. The big bales don't fit into barns. They get left on the field, and if the sales rep from the equipment manufacturer has had a good day, they have sold the farmer (at a "low interest loan") another piece of equipment that spreads plastic over the hay. 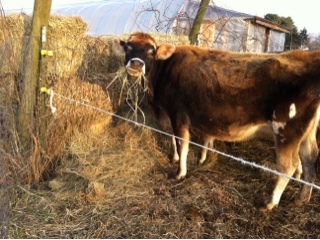 Offer an animal a bale of hay like Calvin makes and stores in the shade of his barn constructed of locally grown and harvested wood and a chunk off a bale of hay that has been inside a sheet of plastic, in direct sunlight since last summer. Which hay do you think they select? 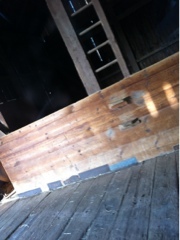 I'm not certain when the barn was built. The license plate hammered into place to cover where things chewed into the wood is from 1931. I do know that my limited sense of smell, compared to what an animal can smell, can still distinguish the sweet smell of summer in Calvin's hay. And the smell of plastic on the more "modern" hay. We will get our hay from Calvin for as long as he continues to make it. The herd of cattle ran like a stampede to get to it. 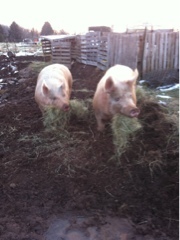 The pigs do their ZZTop imitation, giant mouthfuls consumed. We don't have a barn, so the hay gets stacked in Homer's man cave, where on sunny afternoons he lines a couple bales up and naps on them. The warm sun, the sweet smell of the dry summer grasses, a bit of milk right from our beautiful girl Sybil and he clunks right out. Ah.